Arrays are sequences of heterogeneous elements, are represented as a comma separate list between square brackets; an integer index, between square brackets is used to refer to single elements; We can have arrays of arrays, simulating multi-dimensional structures. The class mixes in the Enumerable module , with a lot of iterators. 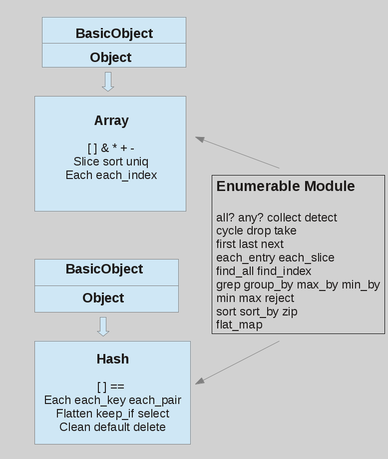 In the following figure the hierarchy of the Array and Hash classes; some class methods are listed in the square box. a=Array.new(3)       : to make an array of 3 elements containing "nil"
a=Array.new(3,"a")   : to make an array of 3 elements containing the object: "a"
The "split" function can obtain an array from a string, the "join" function obtains a string from an array. + concatenates: "a"+"b" => "ab"
join(separator) joins elements into a string: [1,2].join("-") => "1-2"
to_a, a member Enumerable, creates an array from a sequence. Hashes mixes in the Enumerable module, with a lot of useful iterators. The elements are in the order in which they have been inserted in the hash; the last element being the last inserted. The attempt to access to a non-existing elements returns nil or a default value which can be set at the hash creation or with the default= method. Range objects represent an interval in a sequence, are mainly used in loops and case statements, but also as indexes of arrays and strings. Ranges mixes in the module Enumerable, with a lot of iterators. Ranges are written as two numbers or characters separated by two or three dots. When three dots are used the last object is not included, when two are used the last element is included. Not only numbers or characters can be used to make a Range object, but every object which can be treated as a sequence, responding to the comparison method: "<=>" and the "succ" method (which gives the next item of the sequence). We can have array of ranges, in this case ranges are not expanded to the sequence they represent, there is nothing as the list comprehension of Python, and, to built an array of values from the range, the "to_a" method must be used. to_s string representation (1..3).to_s => "1..3"